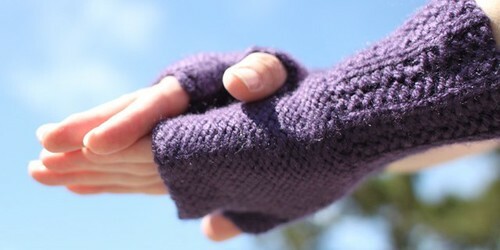 Here is a great quick knit project. 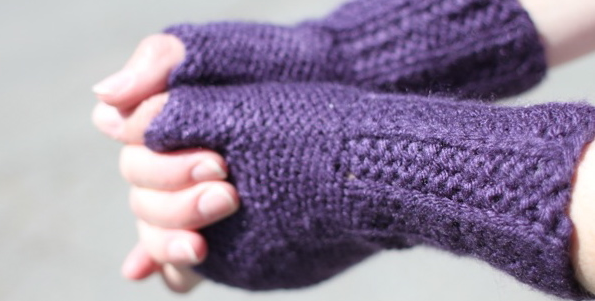 You could knit them for yourself, or as a gift, and because they don’t take too much yarn, it could be done in something luxurious without breaking the bank. With the exception of a couple of u-turns, this is a really easy project. 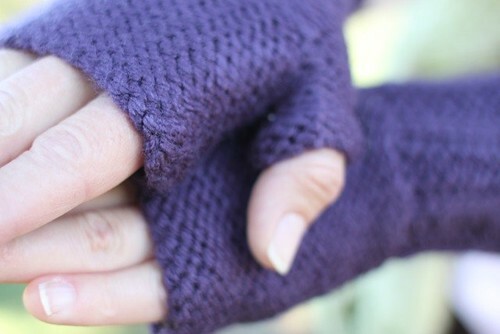 The ribbing used on these gloves is called Cartridge Belt Rib. It is normally done flat, but I have reworked the pattern to make it work in the round. 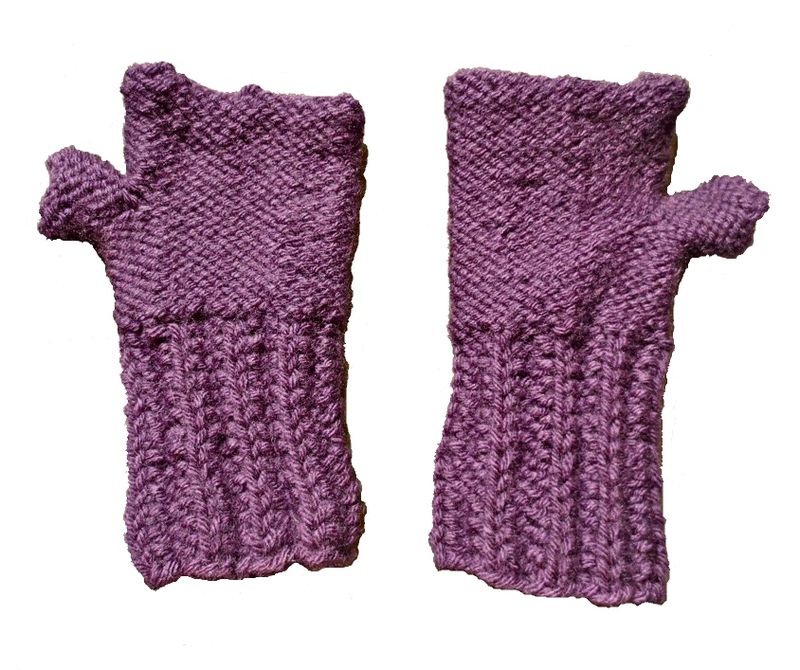 This pattern makes gloves that are about 7″ (17.79 cm) around. 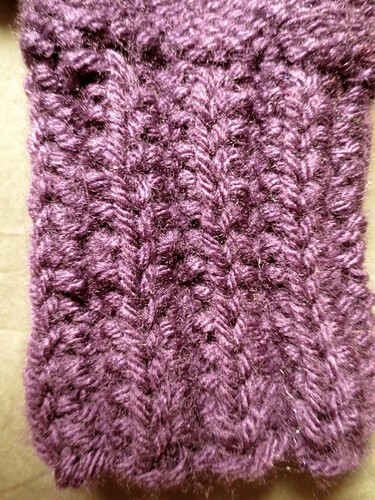 Yarn: Aran weight – I used Vanna’s choice by Lion Brand in “purple”. I thought this was a good hearty choice, 100% acrylic and machine washable. I knit it on a smaller needle than the label. I wanted a tighter stronger fabric. Wrap and Turn – If you have not done a wrap and turn, the Purl Bee has a great tutorial here. There are also a lot of great videos on You Tube. When you are on the “knit” row, the knit stitch predominate in the rib will be in the middle of the 3 knit stitches. When you are in the “purl” row of the pattern, the “yarn behind” will be behind the prominent knit stitch of the rib. Here is a closeup of the rib pattern. Divide stitches across 3 needles. Join in the round being careful not to twist stitches. Work around in row 1 of the rib pattern. Add a stitch marker. To hold the marker on the needle, work the first stitch of row 2 on the end of that needle. The marker will be very helpful in keeping the rib pattern accurate. Knit 10 rounds ending at the marker. Put 5 stitches (that you just worked) on a holder. (for this project, a big safety pin or scrap yarn will work.) Keep knitting. Work 26 stitches, then cast on 5 stitches over the 5 on the holder. (back to 31 stitches on the needles) Work another 14 rounds in purl. Cast off in purl. Divide between three needles. Place a stitch marker to mark rows and work in the round. Purl 8 rows. Cast off in Purl. Variation: If you have thin delicate thumbs, you could purl 5 stitches off the holder, p2tog, purl 5, p2tog in the first round. Then purl 7 more rows. Weave in ends. (there are 4 unattached yarns to weave in.) 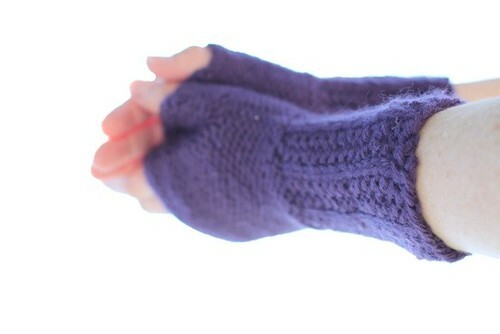 Use the yarn at the base of the thumb to close any small holes that were formed when picking up those stitches. Here they are in their “pre blocked” state. And in all their finished glory! I just started a pair or purple glovies this week and have finished one. I so wish I had seen your pattern earlier because I might have chosen it instead of the one I’m doing. I’m going to keep this in mind for another time! I am so gonna have to make these! 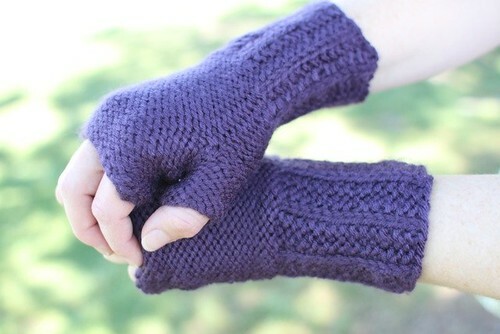 I bought the same exact yarn for a scarf that I no longer want to do and was planning on making some purple fingerless gloves when I found this page! Perfect. I am a little wary of starting them. I have only ever made scarves, which are extremely straight forward. Is this a good “next step” project? Or should I maybe try a couple of other things before trying this? Thanks for any help in advance!